Although not every day has interesting historical connotations for family law, May 18 marks the 78th anniversary of the first federal law criminalizing kidnapping. Congress passed the statute in 1934 in the aftermath of the kidnapping and murder of Charles Lindbergh’s son. Because of that, the statute was popularly referred to as the Lindbergh Law. 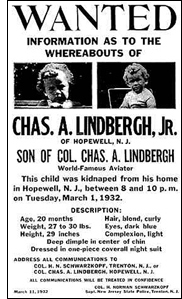 The Lindbergh case is also interesting because the trial and eventual conviction of the man suspected of kidnapping the Lindberghs’ baby provide one of the earliest examples of the conflict between due process and freedom of the press. Heavy media involvement in the search for and apprehension of the man ultimately convicted was intense and caused many to question the validity of the result.